“This is a new war and it’s only the beginning.”- Selene. The Underworld is threatened when mankind discovers the existence of the Vampire and Lycan species that have been thriving in this “alternate universe”. This situation isn’t good for them since mankind has begun a war to literally wipe both species off the face of the earth, like rats during the “Black Plague” years of 14th century Europe. Instead of the Vampires and Lycans banding together against humankind, it’s the “divide and conquer” mentality as they both go after each other as well as their common enemy. 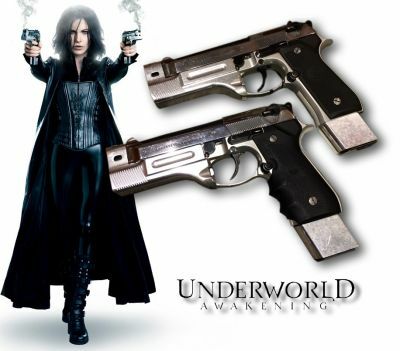 These are the screen used and screen matched signature weapons of Selene (Kate Beckinsale) in the 2012 film Underworld: Awakening. In the film Selene uses a pair of modified Beretta 92FS Inox pistols, fitted with extended magazines and large compensators that extend all the way back along the frame to the trigger guard. These same compensators can be seen on the customized Taurus PT92CS in Crying Freeman, and Dark Angel. This is the only pair of live fire pistols created and used during filming so along with the screen time of being used during multiple scenes of the film, the pistols were also heavily fired. These pistols can also be seen and matched on promotional pictures used by the production and on the films movie posters.